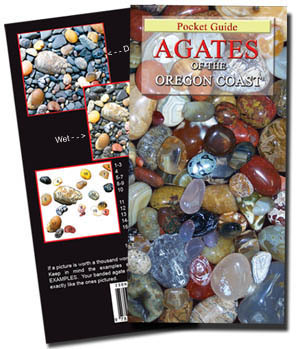 "If your copy of the 1977 classic “AGATES OF THE OREGON COAST” has the rounded corners, blurred type and worn cover of a well-used reference book, then we have some good news. K.T. Myers and Petrovic, the rockhounding experts at Facets Gem and Mineral Gallery in Newport, have just released a revised edition of this handy pocket guide, with updated information, color photographs and map of the current agate-hunting hot spots. Printed on sturdy, water-resistant paper, their 2008 edition shows agates in both their natural state and in all their polished glory. Myers and Petrovic offer explanations and illustrations of the many colors and varieties of agates, including enhydro (or water agates), found on the central coast. There are also sections on the fossil agates, petrified wood and fossils found amidst the cobbles here. It offers tips, safety precautions and more, in a size (8.5 inches by 4 inches) that slides easily into your pocket. It’s a labor of love and industry for this couple, who combined their professional training with their hobbyist passion. Myers has worked in retail sales, gem show productions, jewelry design and fabrication, as well as web design and development (she’s the person behind Facets’ info-laden site, www.4facets.com). Petrovic, a gemologist who had worked in the retail jewelry trade since the 1970s, designed and developed a class called “The Many FACETS of Gems and Minerals,” which he taught at Oregon Coast Community College in Newport. His work in mineralogy has been recognized by the Gemological Institute of America, the Northwest Federation of Mineralogical Societies and the American Federation of Mineralogical Societies. The book for $6.95, is available by mail or by phone order 541-264-5908, or visit one of the other outlets. ©2016 Agates of the Oregon Coast. If you have any questions or comments about this Web site, please e-mail. and Printed by Pioneer Printing of Newport, Oregon.